Carmontelle's Landscape Transparencies - Louis de Carmontelle (1717-1806) was an eighteenth-century French painter and garden designer. He painted a series of panorama scrolls using watercolor, gouache and pen and ink on translucent paper. The scrolls were varying sizes. The width of the scrolls was between 12 to 20 inches wide and the average length was 39 feet. These rolled-up transparencies (rouleaux transparents) were cranked through a viewing box and accompanied by storytelling. Images on the scrolls were of landscape and garden scenery. When connectig two long sheets of paper, he painted a tall tree or building over the seam to make it less noticable. I tried backlighting the box by placing it up against a window and putting the curtains around the box to block out the other light. It worked! Each scroll "lived" in its own viewing box. The translucent paper scrolls were illuminated by placing the box up against a window so that the sunlight could shine through from behind the scroll. Curtains of heavy fabric were placed around the box to block out the other light. I had to try this! 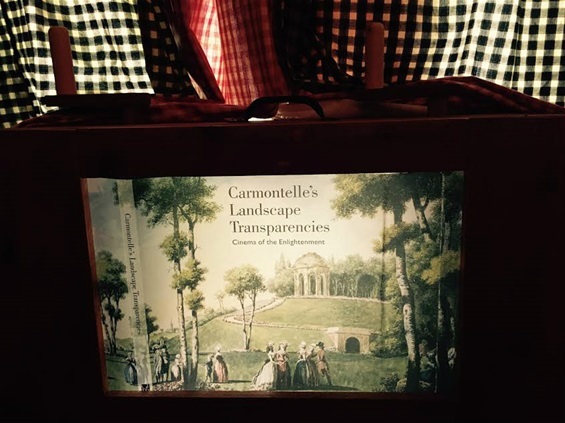 The book jacket of Carmontelle's Landscape Transparencies, was printed on translucent paper, about ten inches high. I just happen to have a crankie box that would hold a scroll that size. I loaded the book jacket into the crankie box, put the box against a window and gathered the curtains around top and sides of the box. The curtains were not of heavy fabric but they still blocked out some of the extraneous light, illuminating the scroll even more. It worked! At least five of the scroll survive. The J. Paul Getty Museum in Los Angeles, CA recreated one of the viewing boxes and made the video below. The viewing box has a lid that folds down to protect the scroll when not in use. Carmontelle's Landscrape Transparencies by Laurence Chatel de Brancion. 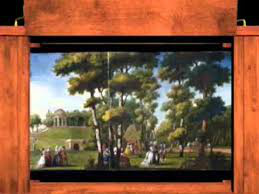 The J. Paul Getty Museum, "Carmontelle's Landscape Transparencies: Cinema of the Enlightenment", Getty Publications, 2008 by Laurence Chatel de Brancion. 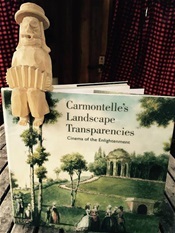 Erkki Huhtamo writes of Carmontelle and his panoramic landscapes in his book published in 2013, Illusions in Motion - Media Archaeology of the Moving Panorama and Related Spectacles. Long Before Video Cameras, a French Artist Brought Motion to His Images, an article in the New York Times, 2007.